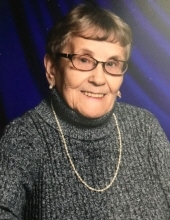 Nancy J. Heckel, 84, Marshfield, passed away on Wednesday, March 27, 2019 in Harker Heights, Texas where she spent winters with her daughter Heidi. A Mass of Christian Burial will be held at 10:30 am on Saturday, April 27, 2019 at St. John’s Catholic Church, Marshfield, with Rev. Samuel Martin officiating. Family will receive relatives and friends from 9:30 AM Saturday until the time of the services at the church. Burial will take place at St. Andrew’s Cemetery, Rozellville. Rembs Funeral Home is assisting the family. Nancy was born in Marshfield, Wisconsin to George and Mary (Illig) Oppman Sr. She was united in marriage to a very special man, Verlyn J. Heckel, on May 4, 1957 at St. John’s Catholic Church, Marshfield. He died on June 11, 1987. Nancy loved being married to Verlyn and enjoyed raising their children in their hometown of Marshfield. Verlie and Nancy contributed to the local community through a variety of ways including the Marshfield Athletic Club where together they ran a very successful 64 team double elimination softball tournament for many years. She also very much appreciated her work at Mid-State Technical Institute due to the students and the exceptional group of colleagues who became dear friends and remain to this day. Her lifelong passions were her faith in Her Lord and Savior, her family, and her friends. Nancy took great delight in seeing her grandchildren grow up and become adults. She enjoyed playing cards and boardgames always feigning naivete before usually beating any opponent even into her later years. Nancy tried to attend every sacrament that a grandchild went through and participated in the mass and Rosary daily through the EWTN Catholic channel. She declared that her purpose on earth towards the end was simply to pray with a special focus on her family. Nancy was preceded in death by her parents, her beloved Verlie and her dear son, Shawn Heckel of White Bear Lake, MN. Additionally, Nancy is preceded in death by her four sisters, Appy Spindler, Ruth Hartle, Marian Britten, and Rosie Glitz and her brother George (Sonny) Oppman Jr.
Nancy is survived by her children, Jeffrey (Isora) Heckel of Woodbridge, VA, Shari (Peter) Brandsness of Klamath Falls, OR, Heidi Heckel of Harker Heights, TX, Tammy (Jim) Gifft of Maple Grove, MN and daughter-in-law, Stacy Heckel of White Bear Lake, MN. She is also survived by twelve grandchildren: Josef, Jon, Anna, Genevieve, Valerie, Stephanie, Patrick, Connor, Trevor, Madison, Anissa, and Camryn and two great grandchildren Catalina and Lennon. She is further survived by a sister, Kay Siemers and a sister-in-law Marge Oppman, both of Marshfield. "Email Address" would like to share the life celebration of Nancy J. Heckel. Click on the "link" to go to share a favorite memory or leave a condolence message for the family.